Motorola has completely revamped its range of smartphones with the unveiling of a third generation Moto G and two variants of its flagship Moto X. Last night’s product launch was the first to take place since Lenovo successfully acquired Motorola from Google. It was orchestrated across four cities — London, Sao Paulo, New Delhi and New York — and choreographed to generate buzz for the inexpensive Moto G and the premium Moto X series. The Moto G is the best selling smartphone in Motorola’s illustrious history, even outselling the popular RAZR of the early 2000s. Improvements made to the third-gen model include double the RAM at 2GB, double the storage at 16GB, improved 13- and 5-megapixel cameras, and an IPX7 rating, which covers it in water three feet deep. It retains its 5-inch display and a quad-core CPU, only the successor operates at a faster 1.4GHz. Pricing for the upcoming Moto G has not yet been announced, but the current model retails for $269 in Australia. Greater changes have been made to the range topping Motorola Moto X, which will be offered in two variants: the Moto X Play and the Moto X Style. Both versions come with a 21-megapixel rear camera and a 5-megapixel front camera. The Moto X Play, a powerful smartphone in its own right, best fills the mid-range of the market. It has a 5.5-inch, Full HD display, a splash resistant coating and a 3,630 milliamp-hour battery, which Motorola claims will last for two days before needing to be replenished. Inside is a custom built Motorola chipset, which is composed of a Snapdragon 615 1.7GHz octa-core CPU, an Adreno 405 GPU, a natural language processor and a contextual computing processor. The smartphone has 2GB of RAM and will come in storage options of 16- or 32-gigabytes, with support for microSD storage cards up to 128-gigabytes in size. 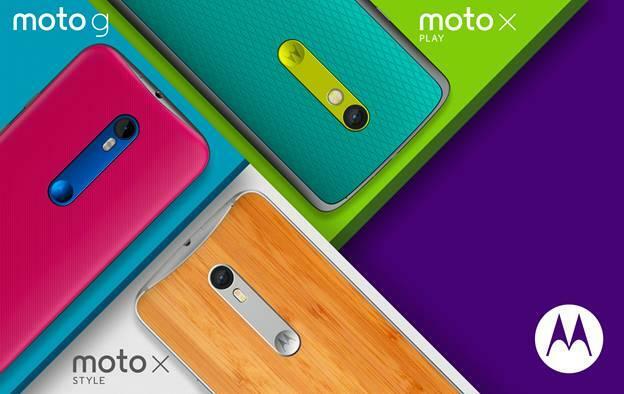 Topping the range is the Moto X Style. It has a larger 5.7-inch, 1440p display, and will have back casing made from real wood. Its Motorola chipset differs with a Snapdragon 808 1.8GHz hexa-core CPU, an Adreno 418 GPU, and dedicated processors for language and context. There’s more RAM at 3GB and it is offered as a 64GB model, in addition to 16- and 32- gigabyte variants. The battery is smaller at 3,000 milliamps-hour, but the smartphone still benefits from a splash resistant nano-coating. Representatives for Motorola confirmed to Good Gear Guide all three smartphones will launch in Australia “soon”, but could not provide explicit details on pricing or availability.